Riot: Civil Unrest is a real-time strategy game from publisher IV Games and Developer Merge Games. Inspired by events that the games creator experienced in Italy. Riot: Civil Unrest puts you in the shoes of either the protestors or law enforcement, depending on which side you chose. The game features multiple modes of play. Scenario, Single Player and Multi-player. Riot on features a riot creation tool which is exclusive to the PC version of the game. It allows you to create your own scenarios and upload them to the Steam Workshop for others to play. Our review copy was on the PlayStation 4, so sadly, we were unable to test this mode. The games feature mode is Scenario. In Scenario mode, you play through multiple stages of different real-world events in Italy, Egypt, Greece, and Spain. Each mission will have a different objective. As protestors, you may need to protect certain things from law enforcement. While playing as law enforcement you may be tasked with pushing the protestors back or keeping them contained for a set amount of time. The game offers different ways to achieve your goals. Protests can be won peacefully or by force no matter the side you are playing on. Each side has different units at their disposal. As law enforcement, you have access to Ballistic, Assault, or Tactical teams. Each one has a different specialty and can be equipped with upgrades. Police have access to things like rubber bullets, water cannons, smoke bombs, or actual bullets if you are feeling particularly lethal. These upgrades will aid you in completing your task but can affect your final score depending on what you use. On the rioter’s side, you will have things like Molotov Cocktails, rocks, benches, and the power of the media to help you get your message across. The premise of the game is very interesting. One may think that a game such as this would be politically motivated, however, the developers of the game have gone out of their way to keep the politics to a minimum. There is a message at the beginning of the game urging the player to do research to allow the formulation of one’s own opinion of the events told in the game. This is to be commended, no matter your political or ideological stance. As great as the premise of Riot: Civil Unrest is, the gameplay is where things start to fall apart. The main issue I have with the game straight away is the lack of a real tutorial. The game just throws you right in the fire and expects you to figure everything out on your own. This can be extremely frustrating. Once you take the time to figure out what you are doing, you will notice that both sides are commanded in the same fashion. You use on-screen buttons to give you control over the different sub-groups in the faction you are controlling. 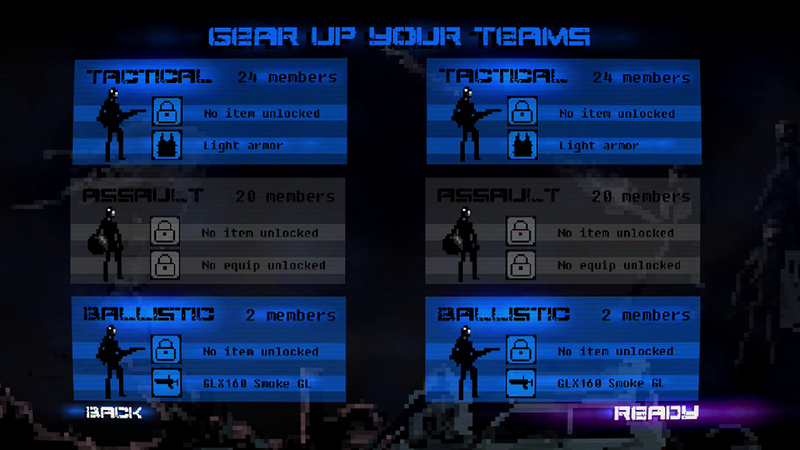 Then another set of on-screen buttons to give that group orders on what tactics to use. It can be a chore to remember which groups do what in the heat of action. Especially when the timer is ticking closers to the end of your event. During gameplay, you will get an on-screen pop up telling you that you may have had some members of your side killed or arrested, but it never tells you which faction they are from. This makes planning your moves a chore because it weakens your sub-faction which can lead to you sending an underpowered group to their demise. This may be realistic, but it dampens the fun of the game. Riot features a pixelated art style that is a mixed bag. When viewed close-up the characters and environments look very nice. You won’t see much in the way of detail, but it lends to the chaos of the events that are unfolding. The area where the graphics can become a problem is in the default gameplay view. When the characters come together they can turn in to a giant blob of pixels. This makes it sometimes difficult to know what is happening. The colors in the game are very dark and muted. This adds to the atmosphere and was a wise design decision for a game like this. The game’s menus look great. They are crisp, clean and easy to navigate. Riot: Civil Unrest is a game that is great in concept but lacking in execution. While there is fun to have, the cons of the game outweigh the pros. A tutorial and better explanation of the abilities of the groups would have helped a great deal. Even when you figure out what does what, the games A.I. never presents much of a challenge and scenarios can become a bit repetitive. 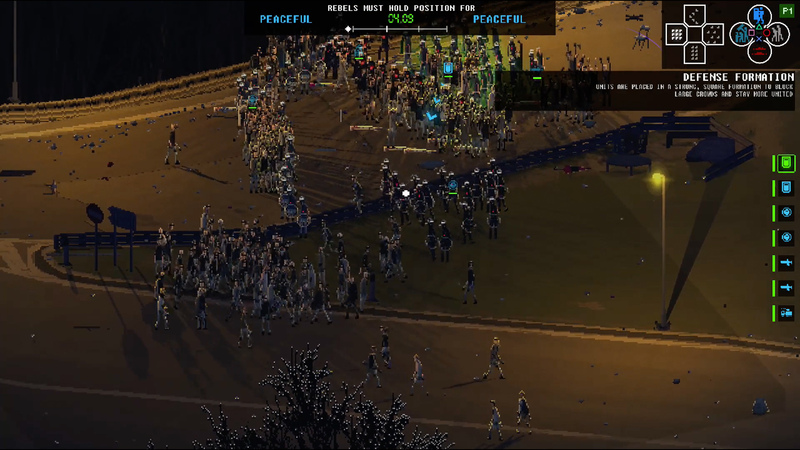 Riot: Civil Unrest is an RTS that could be enjoyed by some but is not for all. The concept is there. The execution is unfortunately lacking.